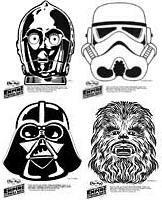 Click here for the 4 great star wars mask templates. Print, Cut and Enjoy! Click Here to see the Star Wars Stamp Collections in hi-res.